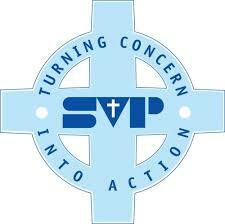 The St Vincent de Paul Society (also known as the SVP) is an international Christian voluntary organisation dedicated to tackling poverty and disadvantage by providing practical assistance to those in need – irrespective of ideology, faith, ethnicity, age or gender. The main work of the SVP is to befriend and assist individuals and families in need through visits to domestic residencies, care homes, hospitals, prisons and other institutions. Our one-to-one approach is possible thanks to the energy and commitment of more than 10,000 volunteer members in England and Wales (over 600,000 worldwide), who undertake the visits and provide support and material assistance as appropriate. St Mary’s SVP is a small but active group, meeting every second and fourth Tuesday in the month to review our work and plan future visits. Loneliness, especially among the elderly is growing, so members spend a lot of time visiting housebound people to prevent them from feeling isolated. Many welcome a friendly face and enjoy a chat over a cup of tea, knowing that someone cares. In 2014/15 we recorded more than 650 visits and also ran a number of excursions. In the developed world, local SVP groups (known as Conferences) help support groups in the developing world through the Twinnage Programme. This enables our brothers and sisters overseas to to increase their efforts to overcome the poverty in their own parishes. Our twinned Conference is in India, for whom we pray, correspond and send financial support yearly. Recently, we have also completed an initiative to raise money for livestock. The SVP has a very successful programme in primary schools called Mini Vinnies. We are blessed with having a wonderful group of Mini Vinnies at St Mary’s Catholic Academy, with more children joining each year. Our Mini Vinnie members give support to people in their community, meeting them face to face and helping in any way they can. The group meets at lunchtime each week to plan how to do this. For more information on the international organisation of St Vincent de Paul, please visit the St Vincent de Paul Society online. More information on Mini Vinnes can be found by visiting the Mini Vinnies online. Interested in joining St Mary’s SVP or would like further information? Please contact the Parish Office by phone or use our Contact form.